A few months back, an astronaut took the first-ever selfie in space, simultaneously defying gravity and Instagram's location settings. 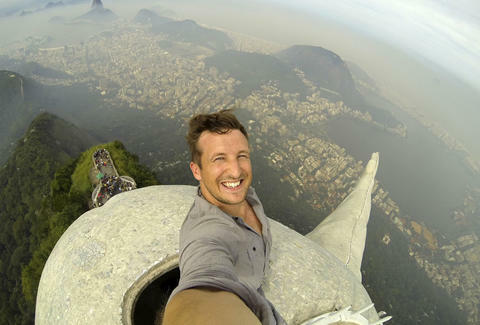 But in a giant leap for self-portraiture still on Earth, one man dared to take a selfie atop Brazil's 130ft-high Christ the Redeemer statue. And it's as panic-inducing an image as you can imagine. 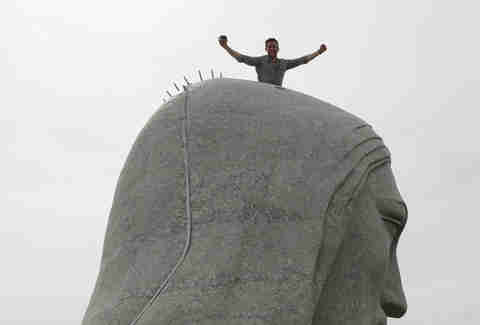 On a trip to Rio de Janeiro to photograph preparation for the 2014 World Cup, the intrepid selfie subject, Lee Thompson -- co-founder of the UK-based travel company The Flash Pack -- became the first human being to photobomb Jesus's scalp after coworker Oliver Harvey persuaded Brazil's tourism board to let the team, crazily, scale the structure. And even more crazily, the tourism board said yes. 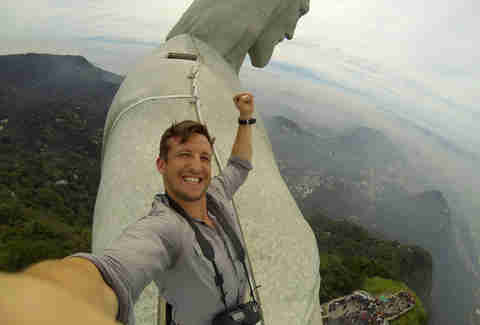 Hoisted to the top of the monument with GoPro cameras and accompanied by two fearless workmen, Thompson showed disdain for acrophobia and snapped the insane image from on high -- and if he is afraid of heights, the guy's just boss at hiding it in this video. "As far as selfies go", Thompson wrote on The Flash Pack's blog, "I can’t compete with popes, presidents, and radical Russians, because as a photographer my job is to take the shots, not star in them. But when the opportunity arose to take the world’s first (and so far only) selfie with Jesus, I couldn’t resist". Thompson must've had some kind of selfie-induced epiphany up there. Or maybe he hallucinated and spoke to God. Either way, after reaching such great heights, he offered this sage take on the selfie: "This once-in-a-lifetime opportunity taught me that the selfie is a powerful medium through which we can share our perspectives, inspirations, and personal stories with the world at large. It's not about funny mugshots with scenic backdrops or daredevil stunts. 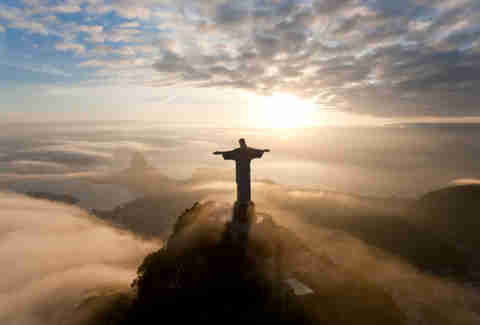 It's a way to mark the moment and say" -- in the great words of Beyonce -- "'I was here'". And here we thought it was just about making duck faces for a Tinder profile. 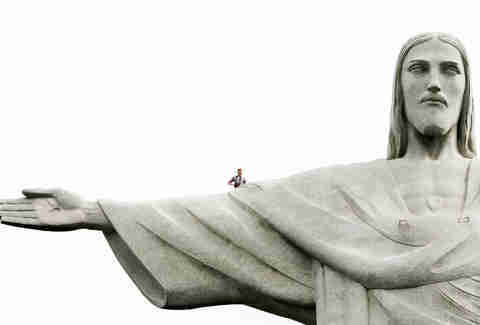 Check out more pictures of Thompson with Jesus below. Chloe Pantazi is an editorial assistant on Thrillist's travel team. She’s on her way to the Empire State Building to take a selfie with King Kong. Follow her on Twitter at @ChloePantazi.